The question, ‘Where do domestic dogs come from?’, has vexed scholars for a very long time. Some argue that humans first domesticated wolves in Europe, while others claim this happened in Central Asia or China. A new paper, published in Science, suggests that all these claims may be right. Supported by funding from the European Research Council and the Natural Environment Research Council, a large international team of scientists compared genetic data with existing archaeological evidence and show that man’s best friend may have emerged independently from two separate (possibly now extinct) wolf populations that lived on opposite sides of the Eurasian continent. This means that dogs may have been domesticated not once, as widely believed, but twice. A major international research project on dog domestication, led by the University of Oxford, has reconstructed the evolutionary history of dogs by first sequencing the genome (at Trinity College Dublin) of a 4,800-year old medium-sized dog from bone excavated at the Neolithic Passage Tomb of Newgrange, Ireland. The team (including French researchers based in Lyon and at the National Museum of Natural History in Paris) also obtained mitochondrial DNA from 59 ancient dogs living between 14,000 to 3,000 years ago and then compared them with the genetic signatures of more than 2,500 previously studied modern dogs. The results of their analyses demonstrate a genetic separation between modern dog populations currently living in East Asia and Europe. Curiously, this population split seems to have taken place after the earliest archaeological evidence for dogs in Europe. The new genetic evidence also shows a population turnover in Europe that appears to have mostly replaced the earliest domestic dog population there, which supports the evidence that there was a later arrival of dogs from elsewhere. Lastly, a review of the archaeological record shows that early dogs appear in both the East and West more than 12,000 years ago, but in Central Asia no earlier than 8,000 years ago. Combined, these new findings suggest that dogs were first domesticated from geographically separated wolf populations on opposite sides of the Eurasian continent. At some point after their domestication, the eastern dogs dispersed with migrating humans into Europe where they mixed with and mostly replaced the earliest European dogs. Most dogs today are a mixture of both Eastern and Western dogs — one reason why previous genetic studies have been difficult to interpret. The international project (which is combining ancient and modern genetic data with detailed morphological and archaeological research) is currently analysing thousands of ancient dogs and wolves to test this new perspective, and to establish the timing and location of the origins of our oldest pet. Wolves likely were domesticated by European hunter–gatherers more than 18,000 years ago and gradually evolved into dogs that became household pets, say a research team based at the University of California Los Angeles. The team’s genetic analysis is published 15 November issue of the journal Science. The researchers studied 10 ancient “wolf-like” animals and eight “dog-like” animals, mostly from Europe. These animals were all more than 1,000 years old, most were thousands of years old, and two were more than 30,000 years old. The biologists studied the mitochondrial DNA of the animals, which is abundant in ancient remains. By comparing this ancient mitochondrial DNA with the modern mitochondrial genomes of 77 domestic dogs, 49 wolves and four coyotes, the researchers determined that the domestic dogs were genetically grouped with ancient wolves or dogs from Europe — not with wolves found anywhere else in the world or even with modern European wolves. Dogs, they concluded, derived from ancient wolves that inhabited Europe and are now extinct. You can read more about the team’s research in this UCLA media release. A very different type of research article has been published in the journal Animal Cognition. This study found that dogs react sociably to robots that behave socially towards them, even if the devices look nothing like a human. What? Yes – that’s right. A research team led by Gabriella Lakatos of the Hungarian Academy of Science and Eötvös Loránd University tested the reactions of 41 dogs with a PeopleBot robot. The robot had two arms and four-fingered hands, resembling a piece of gym equipment with a white gloved hand attached to it. One set of dogs in the ‘asocial group’ first observed an interaction between two humans (the owner and the human experimenter) and then observed an ‘asocial’ interaction between the owner and the robot. 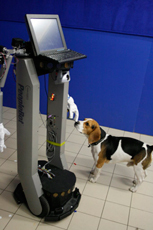 Another set of dogs watched an interaction between the owner and the human experimenter followed by observing a ‘social’ interaction between the owner and the robot. These interactions were followed by sessions in which either the human experimenter or the robot pointed out the location of hidden food. The dogs spent more time near the robot or gazing at its head when the PeopleBot behaved socially. “Roboticists who design interactive robots should look into the sociality and behavior of their designs, even if they do not embody human-like characteristics,” Lakatos advises. A genetic study by Peter Savolainen, a researcher in evolutionary genetics at KTH Royal Institute of Technology in Stockholm, has found that dog breeds from North and South America have Asian ancestry. The native breeds have 30 percent or less modern replacement by European dogs. It had been thought, prior to this study, that when Europeans settled in the American continent their dog breeds successively replaced the genetics of the native breeds. Savolainen’s research group, in cooperation with colleagues in Portugal, compared mitochondrial DNA from Asian and European dogs, ancient American archaeological samples, and American dog breeds, including Chihuahuas, Peruvian hairless dogs and Arctic sled dogs. They traced the American dogs’ ancestry back to East Asian and Siberian dogs, and also found direct relations between ancient American dogs and modern breeds. 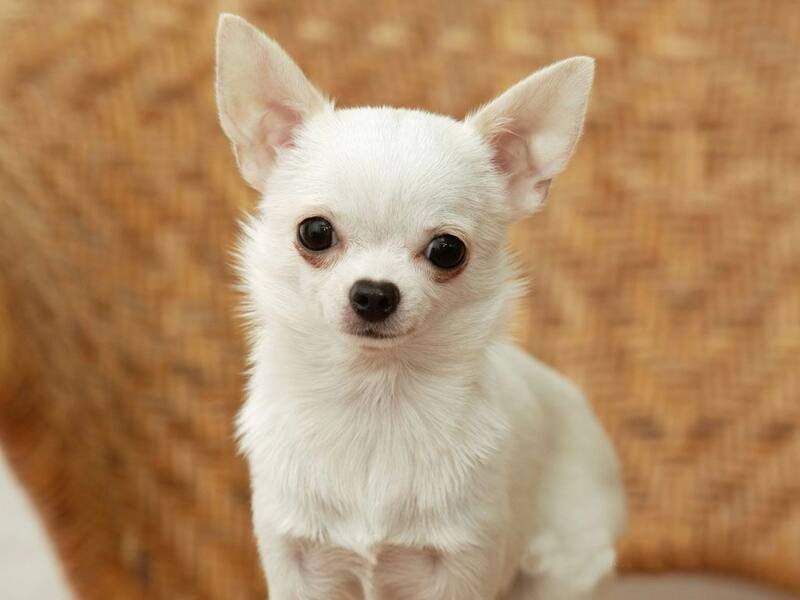 The research confirmed conclusively that the modern day Chihuahua has Mexican roots. The breed shares a DNA type uniquely with Mexican pre-Columbian samples. The team also analysed stray dogs, confirming them generally to be runaway European dogs; but in Mexico and Bolivia they identified populations with high proportions of indigenous ancestry. Many dogs suffer from hyperadrenocorticism, more commonly known as Cushing’s Disease. The disease is characterised by excessive amounts of hormones known as glucocorticoids that are produced by the adrenal glands. The disease is more common in older dogs. Most cases result from a tumour in the pituitary gland but some are caused by tumours in the adrenal glands. The symptoms of a dog with Cushing’s Disease often ‘creep up’ on the owner and vet. Common symptoms include excessive drinking (and urination) and overeating, leading to a pot-bellied appearance, as well as with loss of hair. Since all of these symptoms can stem from a number of disorders, it is difficult to be certain. The methods traditionally used to diagnose the disease are complicated and costly and usually give information about the hormone concentrations at the time a sample is taken. Since most dogs are stressed by veterinary examinations, their hormone levels will peak because of the stress – making it difficult to rely on the analytical results. Researcher Claudia Ouschan and colleagues at the University of Veterinary Medicine, Vienna decided to look for a way to monitor the long-term levels of glucocorticoids in dog hair that would also offer a diagnostic option that was less stressful to the dogs. She compared the levels of cortisol, corticosterone and cortisone in the hair of twelve dogs with hyperadrenocorticism and ten healthy dogs. The results were striking: all three hormones were found at far higher levels in the hair of dogs with Cushing’s Disease than in the control group, with the increase in cortisol particularly pronounced. 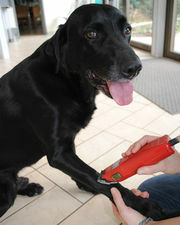 Her research has been published in the journal Veterinary Dermatology. I’m ‘on the record’ that I don’t support breed specific legislation (BSL) and I consider it one of New Zealand’s great shames that it has adopted such laws (just one of the issues I raised when I submitted to the review of the Animal Welfare Act). There’s scientific research that shows why visual identification is a fatal flaw in BSL. Some of this research has been conducted by Dr Victoria Lea Voith who is based at the Western University of Health Sciences, College of Veterinary Medicine. 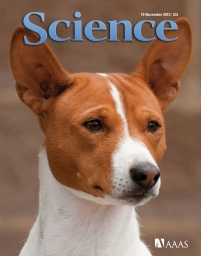 This year (2013), Voith and her colleagues published another paper entitled “Comparison of Visual and DNA Breed Identification of Dogs and Inter-Observer Reliability” Since their previous paper was based on the identification of breed by a single person, the research team wanted to see if the success rate of breed identification improved when multiple people were involved. The research team presented one-minute video clips of the same 20 dogs to over 900 people who were engaged in dog-related professions or services. For 14 of the dogs, fewer than 50% of the respondents visually identified breeds of dogs that matched DNA identification. For only 7 of the dogs was there agreement among more than 50% of the respondents regarding the most predominant breed of a mixed breed. In 3 of those 7 cases, the visual identification did not match the DNA analysis. This study reveals large disparities between visual and DNA breed identification as well as differences among peoples’ visual identifications of dogs. These discrepancies raise questions concerning the accuracy of databases which supply demographic data on dog breeds for publications such as public health reports, articles on canine behavior, and the rationale for public and private restrictions pertaining to dog breeds. If you still want to know more about this issue, you can visit the Breed Identification page of the National Canine Research Council. On this page, you can download color posters that further explain the problems associated with visual identification of breeds. The structural abnormalities in the brains of dogs suffering from canine compulsive disorder (CCD) are similar to the abnormalities found in humans suffering from obsessive compulsive disorder (OCD) according to new research. A collaboration between veterinarians at the Cummings School of Veterinary Medicine at Tufts University and researchers at the McLean Imaging Center at McLean Hospital, in Belmont, Massachusetts have published their findings in Progress in Neuro-Psychopharmacology & Biological Psychiatry. The study involved 16 Doberman Pinschers, 8 with CCD and 8 without. Dogs with CCD engage in repetitious and destructive behaviors such as flank- and blanket-sucking, tail chasing, and chewing, whereas people with OCD tend to have repetitious behaviors that interfere with their daily life. “While the study sample was small and further research is needed, the results further validate that dogs with CCD can provide insight and understanding into anxiety disorders that affect people. Dogs exhibit the same behavioral characteristics, respond to the same medication, have a genetic basis to the disorder, and we now know have the same structural brain abnormalities as people with OCD,” said Nicholas Dodman, BVMS, DACVB, professor of clinical sciences at the Cummings School of Veterinary Medicine at Tufts University. It should be noted that the research also provides insight into dog behavior and management. In some cases, a dog labelled as ‘bad’ or ‘destructive’ may actually have a biological basis for their problems.